Dusky Shark image copyright Andy Murch all rights reserved. 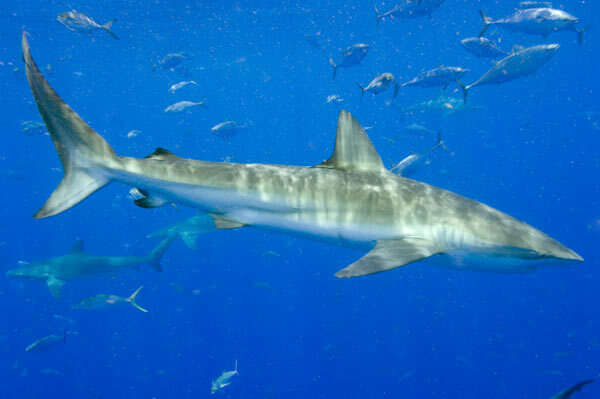 Encounter: Dusky Sharks, Scalloped Hammerheads, Silkies, Whale Sharks, Makos, and more. A blue water encounter specifically for professional photographers and highly experienced, shark savvy free divers. Operators: Captain Al Walker operates a speed boat which runs snorkellers and divers out to where the blue water starts. This can be as far as 50 miles off shore. Each shark encounter has to be planned in advance because specific species are found at each individual seamount. Pelagics such as whale sharks may be encountered at any location during their seasonal migrations into the gulf. Because Venice is a well established tuna sport fishing destination, Al has access to a daily supply of of enormous tuna carcasses which the sharks cant resist. His trips are highly unique because of the species they attract but they are also not for the faint hearted. The sharks can be very aggressive and no cages or other protection is provided so if you are interested in chartering Al's boat, be prepared for some very intense and potentially quite dangerous action. Al has been documenting each shark encounter that he has had over the last few decades. This has allowed him to build a database that can pinpoint exactly where each species will be at any particular time. His knowledge of sharks along the Louisiana coastline is extraordinary. Venice is a 1-2 hour drive south of New Orleans. It is a small sport fishing community with few amenities. As of the summer of 2006 Venice had just reopened after being completely flattened by the huge hurricane that devastated New Orleans. By now accommodation and restaurant choices should be a little better.